Please note: All my images on the photography pages below are copyrighted.You may download any of the images, use them in personal startup screens, and share them with friends so long as the copyright notices are not removed. They may not be used in any shareware, freeware, or commercial product, publication or other media without arrangements with the artist. 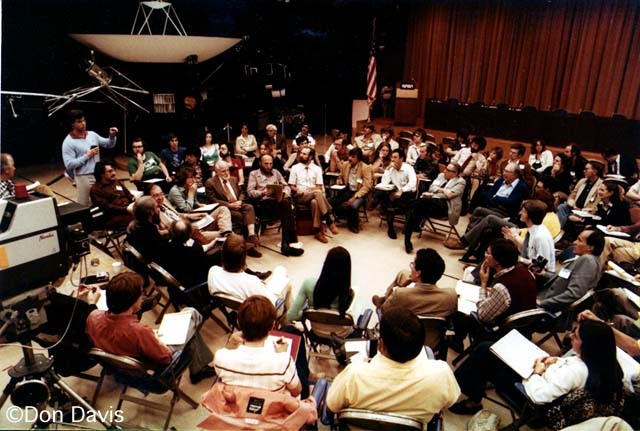 During the initial return of data from the Voyager 1 Saturn encounter a few spontaneous gatherings occurred during which space related journalists gathered in a circle around mission scientists in Von Karman Auditorium at the Jjet Propulsion Laboratory, next to the full scale replica of the spacecraft. Voyager, particularly Voyager 2, filled in a good deal of the emptiness of our knowledge of the Gas Giant planets of the Solar System. 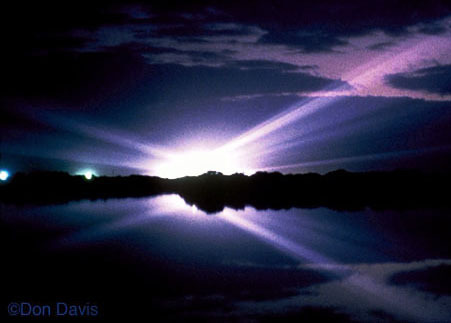 As dawn broke on the day of the first launch attempt of STS-1, the first Space Shuttle mission, the artificial and natural lighting delicately interplayed for a few magic minutes.